The river flows from the historic trading site known as Dalton Post in the Yukon, through BC, and the Alaskan Panhandle to end at a small fishing cannery at Dry Bay on the Pacific Ocean. The river connects the Interior Plateau with the Pacific Ocean bisecting the St. Elias Mountains which containthe world’s largest non-polar ice caps and some of the planet’s most spectacular scenery. Perhaps it is the wildest and most visually spectacular river in North America. The Tatshenshini flows through the heart of the largest bio-preserve in the world. Grizzly Bear, Mountain Goat, Moose, Bald Eagle, multiple species of Salmon, a plethora of unique wildflowers including entire mountainsides painted in pink fireweed (Yukon’s Territorial flower), and Arctic Terns are just some of the abundant natural history waiting to be experienced by our guests. From drifting through Quiet Canyon in the vast Spruce Forests of the Interior to paddling by giant icebergs and walking on glaciers or witnessing history in action as a giant tributary deposits sediment on an expansive flower covered gravel bar, the geologic phenomena awaiting is nothing short of breathtaking. This trip has been described numerous times as one of the top 10 river trips in the world. A complete itinerary along with maps, clothing and equipment list, will be issued upon registration. Included: Rafts, paddles, PFDs [life jacket], waterproof bags, transportation from Whitehorse to put-in and return, park user fees, camping fees, cooking gear, camp stoves, any charter flights associated with trip, tents, meal preparations, meals/snacks/beverages on the expedition, tarps, major first aid supplies, emergency radio or satellite phone, and professional guides. Excluded: Transportation to Whitehorse, transfers, accommodation and food other than included in the itinerary, gratuities, and personal equipment. Meals: Beginning with lunch on Day 1and ending with lunch on Day 10. Day 0: Arrival in Whitehorse. This denotes the day or days spent in Whitehorse before the listed start date of the trip. Day 1: Our drive from Whitehorse takes us north on the Alaska Highway to Haines Junction, then west along Haines Road to the Dalton Post turnoff. At this old abandoned trading post, we’ll meet the other guides, load the rafts and leave civilization behind. Today we will run a number of lively class III rapids through the gorge then emerge, a few hours later, into a wide open valley to see our first views of the mountains with their hanging glaciers. We arrive at our first camp, Silver Creek. Day 2 & 3: We meander quietly through Quiet Canyon, the Oxbows, and past Bear Bite Creek, while enjoying the panoramic mountain vistas. On Day 3 we camp at the mouth of Sediments Creek where we’ll spend two nights. This campsite is the start point for our first alpine hiking opportunity. Day 4: Weather permitting, this is a hiking day. We split up into groups for hiking and exploring and a chance to overlook the river and surrounding area – or you can just relax at camp enjoying the majesty of the surroundings. Day 5 & 6: We’ll continue down the Tat. Every day the scenery becomes more spectacular as the mountains rise to 8,000 feet and glaciers hang from mountainsides. The river valley will continue to widen as we reach our camp just above the confluence with the Alsek River. Here there are great hiking opportunities along the river terraces where wildflowers carpet the ground. The mighty Alsek River joins us from the north as we travel through the braided channels. A panarama look reveals over 20 glaciers. Day 7, 8, and 9: Cutting through the Barbazon Range, we’ll pass the massive Novatak Glacier, which is the tip of the largest ice field outside of the polar regions. To the south is Mount Fairweather, the 4th highest mountain on the continent.We’ll paddle out amongst the ship-sized icebergs and watch as giant, 100-foot chunks of ice calve off the glacier with a thunderous roar. We’ll camp on the spit of land that separates the Alsek River from Alsek Lake, a 5km-long lake located at the bottom of the massive Alsek Glacier. 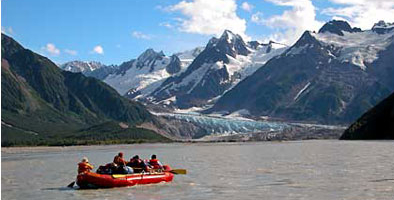 Depending on weather and timing, we may have the opportunity for a layover day at Alsek Lake—with time to paddle amongst the icebergs, hike or just relax and enjoy the incredible vista from camp. Day 10: After breaking camp for the last time, we’ll float the last few miles down to the airstrip at Dry Bay, Alaska on the shores of the Pacific Ocean. Here, we’ll collapse the rafts and board our plane for the spectacular flight over the mountains back to Whitehorse.